A library is a place set apart to contain books, periodicals, and other material for reading, viewing, listening, study, or reference. Most libraries are either private collections or publicly available lending libraries which are generally funded by taxes and donations. A library may also be part of a commercial establishment and not deal with the public. In the 19th century lending libraries were common, where people could rent books. After Andrew Carnegie set up 3000 libraries in the US, Britain and Canada (1900-1920), the public library has been a major factor. Colleges and universities maintain libraries for their students, as well as research collections that are open to the public. The largest public libraries include the Library of Congress, the British Library and the New York Public Library. The largest university libraries are at Harvard, Yale, Illinois, Berkeley, and Stanford. Most academic libraries have a "rare rbook" collection, and there are some private libraries that specialize in rare books, such as the Newberry Library in Chicago. 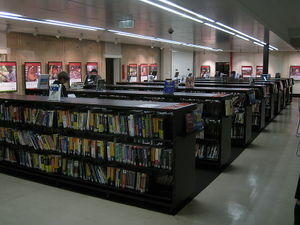 Public and academic libraries typically provide access to online databases that have copies of books and recent articles from magazines and scholarly journals. They subscribe to services such as EBSCO, JSTOR, Project MUSE and History Cooperative. People can use these resources from off-site if they have a password, as is common in colleges and universities. Due to the popularity of the internet, some institutions have set up Electronic libraries, consisting entirely of e-books, and .PDF files. By definition, the entire Internet is a massive library, hosted across nations, and completely unrestricted. This page was last modified on 25 March 2017, at 21:52.